Genital Warts. I’ll let you imagine where they might be located. Aldo Torrente recently wrote, “Currently I have several patients with genital warts. In my facility there are three alternatives: podophyline, verruca freeze, and trichloroacetic acid. Condylomata acuminata (genital warts) is,of course, a sexually transmitted disease caused by Human Papillomavirus (HPV). There are three basic ways of getting rid of genital warts (or any warts, for that matter). The first way is to destroy all of the tissue where the wart virus resides. This is usually done surgically by excising all of the warts or burning them off with electrocautery. We probably will not be doing this much in correctional facilities. The second approach is to apply an irritating chemical to the wart which works mainly by stimulating the patient’s immune system to recognize the diseased tissue and to destroy it. There are various irritant chemicals that can be used for this purpose: Trichloroacetic acid and podophyline mentioned by Aldo work, but podofilox, sinecatchins, and imiquinod are considered by dermatologists to be superior (and more expensive) agents. These chemicals are all quite irritating so they need to be meticulously applied. Many of them, like trichloracetic acid, should not be applied to the normal surrounding skin. One way to do this is to create a moat-barrier of vaseline around the wart before you apply the irritant. For a patient with a lot of warts, this can take quite a bit of time. Also, these agents should be applied often. Trichloroacetic acid is applied every 3 days. Podofilox is applied 2 times a day for 3 days then not applied for 4-7 days and then the cycle is repeated. Imiquod is applied 3 times a week for 8 weeks. Clearly the chemical agents are labor intensive. In the outside world of dermatology, these agents are typically only used on patients who are considered reliable and careful enough to apply these chemicals themselves. This would not work in a correctional setting, of course. There is too much risk of patients doing it wrong or using the irritating chemicals in mischievous ways. However, to bring these patients into the prison clinic for each of these meticulous and time consuming applications takes too much of your time and effort. This is true of outside dermatology clinics, as well. Patients who are not good candidates for self-application of the chemicals are treated with the third treatment option, cryotherapy. The last option for treating genital warts is cryotherapy. 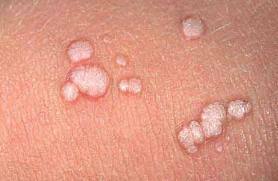 Dermatologists use liquid nitrogen to freeze the warts but since liquid nitrogen evaporates, it is usually not feasible for use in our clinics. Much better for our clinics are cans of freezing solution, like Histofreeze or Verrucafreeze mentioned by Aldo. These do not get the tissue as cold as liquid nitrogen but they work just fine nevertheless. Freezing the warts has several advantages over the chemicals, especially in correctional settings. First, you only have to do the freezing once a month. Regular warts on, say, the hand can be frozen more frequently but since genital warts are found on (How shall I put this?) delicate tissues, there is no advantage to freezing more often. Second, you don’t have to be as meticulous as with the chemical agents. Especially if you use the freezing guides that look like a big otoscope tip, these treatments can be done very quickly. Third, cryotherapy is not as irritating or painful as the chemicals (though it still hurts). There is no chance of the irritating chemicals accidentally rubbing off onto normal skin of the patient or others and causing problems. So cryotherapy, in my opinion, is the best overall technique for getting rid of genital warts in correctional facilities. The only problem with cryotherapy is the cost of the cans of commercial freezing agents. Verrucafreeze and Histofreeze both cost well over $400.00 for a canister with around 60 doses. That is $7.00 per application! No wonder correctional clinics have turned to chemical agents, despite their many disadvantages. However, it turns out that there is a much cheaper alternative. 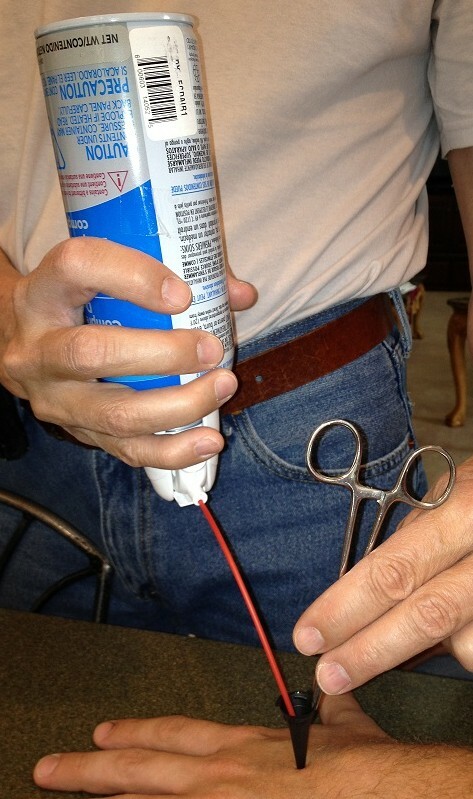 Using an air-duster can held upside down to freeze a wart. You know those canisters of compressed air that are used to clean your computer keyboard? I’m going to call them air-dusters. If you hold air-dusters upside down, the spray they generate will freeze tissue just like the commercial sprays. But air-duster canisters only cost around $6.00 a can rather than $400.00 a can. The ingredients are almost identical. Verrucafreeze contains tetrafluoroethane, pentafluoroethane and trifluoroethane, whereas a typical air-duster can contains tetrafluoroethane and difluoroethane. At my prison facility where we do wart removal, we initially used the expensive commercial freezing canisters like Verrucafreeze, but about three years ago switched to using air-duster cans held upside down. I can tell you from experience that they are identical in efficacy to the commercial products. So there is your answer, Aldo. The most cost-effective technique for treating genital warts is cryotherapy done with an air-duster can held upside down. Is anyone else using this technique? Please comment. Would your facility be interested in doing and publishing a formal study comparing commercial freezing sprays to air-duster cans? Especial thanks to Neelie Berlin, PA Extraordinaire, who helped me extensively with this post! This entry was posted in Dermatology, Medical Practice and tagged correctional medicine, Genital wart, jail medicine, jails, prisons on June 18, 2012 by Jeffrey Keller MD. I used air duster in Afghanistan when my troops came back from leave with warts and wanted treated before going home. We went through Histo Freeze quickly and I used this with otoscope tips quite effectively. If not careful, one could overspray and spill so light trigger finger needed. awesome and cheap! Thanks William! I agree that it takes a light touch on the air-duster trigger, but you can master that with just a little practice. The best way I have found to prevent “spillage” over too much skin is to get a good seal with the otoscope-like freezing guides. If I don’t have one of those available, I spray the solution onto a cotton tipped swab and freeze the wart with the swab. It takes more applications and more time to get the job done, but it works without spilling. Thanks to all of you that have contributed to this subject. As always is an unbelivable source of valuable information, that I am going to apply right away!!!!!! Should one be concerned about medico legal issues on using an air duster (not a medically approved treatment chemical) on a highly litigius population in case some complication happens? Isn’t this also a case of using something that is not a medical equipment or treatment strictly for cost cutting purposes? Sorry for the tardiness of this reply! Evidently, the first reply I wrote did not get posted. I personally don’t see a medico-legal problem with this since the two cans contain the same ingredients. The only thing that is different is the label on the outside of the can and how much of the ingredient is in there. The main medico-legal issue instead is consent: informing the patient of the potential (but rare) complications of the procedure, so if one of these happens, he/she is not surprised. But certainly, there is nothing wrong with asking the opinion of your facility’s legal counsel! Do what you may, but be wary of being sued or not. My patients would ask about what I was doing and then what do I say? I bought this at the hardware store, don’t worry. Until they get a result that does not meet their expectations…even if I tried to under-promise and over-deliver. Hey, don’t worry I bought this scalpel, actually and Exacto Knife, at the hardware store. Crazy. Find me one attorney who would recommend this, just because one MD did. Thanks for the comment, Ralph. Medico-legal considerations are always important. However, since the active ingredient is the same no matter which can it came out of, I consider it to be a similar consideration as using name brand vs. generic drugs or US manufactured vs. Canadian manufactured medications. All are controversial to some degree and opinions come down on both sides. The only way to settle the matter scientifically would be with a double blind trial–which, of course, will never happen. This is a great idea. Regarding legal concerns: I just took the blue insulation Koozie thingy that came with the expensive Verruca Freeze kit and wrapped it around the air-duster can. Now you can’t read anything but the 12oz. Still using the old Verruca Freeze box with all the cool pics on the cover. Thanks! can you share the brand of the duster you found that only has the two ingredients? I don’t see a significant medicolegal issue here, but of course if one is seeing very litiginous patients most things one does (or doesn’t do) may be grist for their mill. If the concern is limited to the device per se, why not just use dry ice? There are many published reports of its successful use in dermatology and it is relatively inexpensive. It is also not a “medical device”. Thanks for the comment Tom. Logistically, I do not see how dry ice could be used successfully in a jail clinic. Any chance for unique complications from the bitterant being put on skin that’s being frozen? Any liquidfind gas will work. I’ve used butane many times, sometimes using a cotton swab to apply the liquid gas. It’s not as cold as some but with repeated applications in the same sessions it works well.